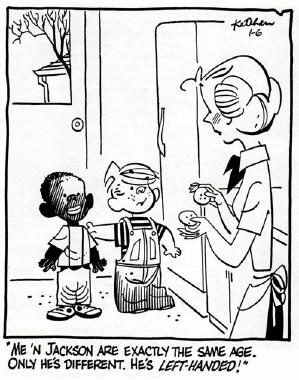 Rumor: The portrayal of a black character in a 'Dennis the Menace' cartoon prompted outbursts of violence and apologies from newspapers that published it. 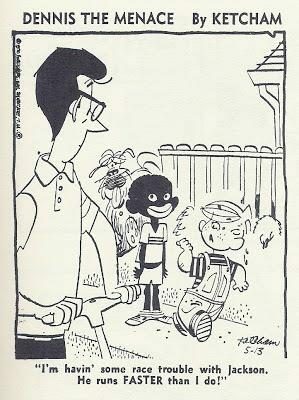 Claim: The portrayal of a black character in a Dennis the Menace cartoon prompted outbursts of violence and apologies from newspapers that published it. had to post an apology. reference I can find see some blog posts that seem to start in 2008. Lilies of the Field, it wasn’t until 1965 that a prime-time network television drama finally featured a black actor in a lead role (when comedian Bill Cosby was tapped to co-star with Robert Culp in the espionage series I Spy,) and 1965 was also the year that a black hero was first featured in an American comic book (the unfortunately short-lived Western series Lobo). playing on the beach, and Franklin said, “Well, it’s been nice being with you, come on over to my house some time.” Again, they didn’t like that. Another editor protested once when Franklin was sitting in the same row of school desks with Peppermint Patty, and said, “We have enough trouble here in the South without you showing the kids together in school.” But I never paid any attention to those things, and I remember telling Larry [Rutman, president of the United Features syndicate] at the time about Franklin — he wanted me to change it, and we talked about it for a long while on the phone, and I finally sighed and said, “Well, Larry, let’s put it this way: Either you print it just the way I draw it or I quit. How’s that?” So that’s the way that ended. But I’ve never done much with Franklin, because I don’t do race things. I’m not an expert on race, I don’t know what it’s like to grow up as a little black boy, and I don’t think you should draw things unless you really understand them, unless you’re just out to stir things up or to try to teach people different things. I’m not in this business to instruct; I’m just in it to be funny. Now and then I may instruct a few things, but I’m not out to grind a lot of axes. Let somebody else do it who’s an expert on that, not me. doesn’t understand its use as an anthropological term. Hence his perception of “race trouble” is nothing more than being perturbed that Jackson runs faster than he does. A harmless little play on words and, I felt, a soft, amusing beginning. Not so. The rumble started in Detroit, then moved south to St. Louis where rocks and bottles were thrown through the windows of the Post-Dispatch. Newspaper boys were being chased and hassled in Little Rock, and in Miami some Herald editors were being threatened. The cancer quickly spread to other large cities. I first heard the news in a midnight transatlantic telephone call to my Geneva apartment from the syndicate in New York. I was shocked, then frustrated, then mad as hell, and, at the request of my beleaguered colleagues fielding complaints from all over the country, dictated a statement to the client newspapers involved. I made a point not to apologize but to express my utter dismay at the absurd reaction to my innocent cartoon and my amazement at the number of “art directors” out there. Any regular Dennis-watcher would surely know that I am never vindictive or show any intent to malign or denigrate. 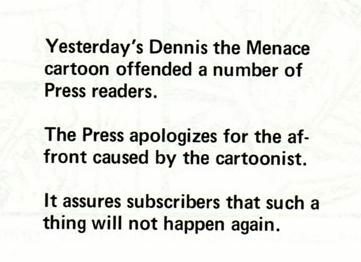 But I guess those violent protestants were not avid followers of newspaper comics. And they weren’t complaining about the “gag”; it was my depiction of Dennis’s new pal that got their tails in a knot. I gave them a miniature Stepin Fetchit when they wanted a half-pint Harry Belafonte. It seems that Sammy Davis, Jr., was the only one who could safely poke fun at the minorities. To this day, Jackson remains in the ink bottle. A pity.